Instead of an elaborate multi-course meal, the Queen opted for finger foods to be served. Prince William and Catherine gave their input, but most of the menu was selected by the Queen. Finger foods were most likely chosen because Buckingham Palace simply can't accommodate large groups of people for dining. The palace kitchens are designed to handle more formal dinners of about 150 people. Along with the delicious hors d'oeuvre, guests were served Pol Roger NV Brut Réserve Champagne with a selection of other soft and alcoholic drinks. Approximately 10,000 canapés were prepared by a team of 21 chefs, led by Royal Chef Mark Flanagan. Guests were served quite a variety, with all of the ingredients for the canapés carefully sourced from Royal Warrant holding companies using UK-based ingredients. The duck in the pressed duck terrine with fruit chutney was Gressingham duck, and the roulade of goats cheese with caramelized walnuts came from Paxton and Whitfield. English asparagus was used for the poached asparagus spears with Hollandaise sauce for dipping as well as the miniature watercress and asparagus tart, and the celery salt in the quail's eggs was Welsh organic. Scottish langoustines with lemon mayonnaise were passed, as was Scottish smoked salmon rose on beetroot blini. Cornish crab salad on lemon blini was served along with a pressed confit of pork belly with crayfish and crackling, which featured pork from the Cotswolds and local crayfish. Guests enjoyed bubble and squeak with confit shoulder of lamb from the Windsor Estate, as well as smoked haddock fishcake (made from Smoked Haddock from the East Coast of Scotland) with pea guacamole. Beef from the Castle of Mey selections in the North Highlands of Scotland was the main ingredient in miniature Yorkshire pudding with roast fillet of beef and horseradish mousse. In addition, an assortment of palmiers and cheese straws, wild mushroom and celeriac Chausson, and grain mustard and honey-glazed chipolatas were passed throughout the reception. Whether you prefer fruit or chocolate, there was plenty to choose from when it came time for sweets. There was a gateau opera cake, blood orange pate de fruit, raspberry financier, and passion fruit praline. English rhubarb made its way into a rhubarb crème brulee tartlet. For chocolate lovers, there was white chocolate ganache truffle, milk chocolate praline with nuts, and dark chocolate ganache truffle. The reception also included the cutting of the eight-tier Fiona Cairns-designed wedding cake, made of 17 individual fruit cakes and decorated with cream and white icing. 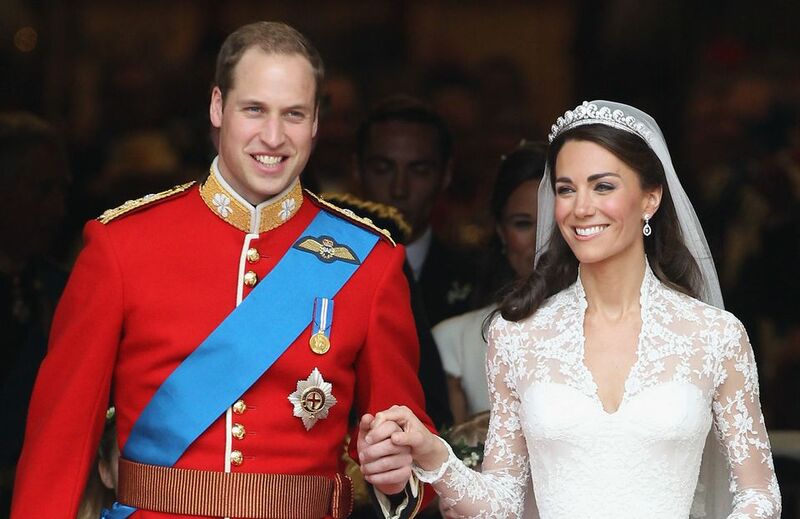 There was a separate groom cake for Prince Williams, a chocolate biscuit (cookie) cake made from an old family recipe.